To paraphrase the late, great James Brown, Charles "Chuck" Motter's got a brand new bag. No, not just any bag; Chuck has what many consider to be the ultimate bag for court reporters: The Tutto Slim Design Steno on Wheels bag. 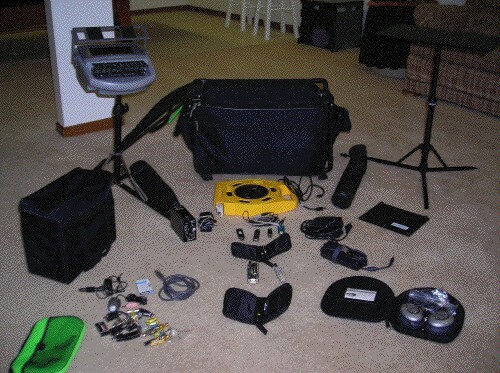 Chuck, a freelance reporter for 26 years and a CART/captioner for the past seven years, has kindly allowed me to adapt his post from the NCRA Forum about his (brand new) Tutto Bag. I have had a couple of things go wrong with the case. I broke a wheel from the case but Tutto replaced it for me at no charge other than shipping, and when it is unpacked, it is very light so the shipping from Kansas City (me) to San Francisco (them) was not a lot. Can't remember what it was at this point. Secondarily, the zipper on the main rectangular cavity has pulled away in one spot but still is very functional and has been that way for quite a while now. That actually happened on a long trip where I, frankly, overpacked it. 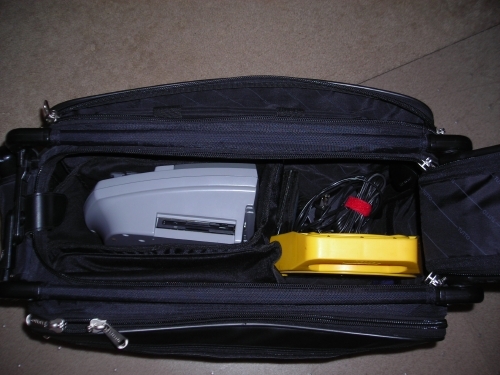 I regularly put this fully-packed thing in overhead compartments of planes (providing you're not on a regional jet where NOTHING fits in the overheads). And the best part? It's slim enough, even fully packed, that it fits beautifully down an airplace aisle. No more catching of straps or the case itself on the corners of the seats as you're progressing down the aisle. There are two negative things I can tell you about this bag from my viewpoint. Number one, it is HEAVY once you have it packed like I have it packed. To offset that, the thing travels up and down curbs seamlessly. You just simply lift the front wheels up on the curb, and then pull and it sort of levers itself up and over the curb. I also take it on escalators all the time and just roll it right on, let the front wheels rest on one step and let the rear wheels catch the next step. So it rides up at an angle, but you've got ahold of the handle and it's not going anywhere. The weight is obviously an issue when you're either confronted with a flight of stairs or when you have to hoist it into an overhead compartment on a plane. I'm a big guy, and it's a challenge for me at times, so take that into consideration. The other small negative thing about this case is the handle. 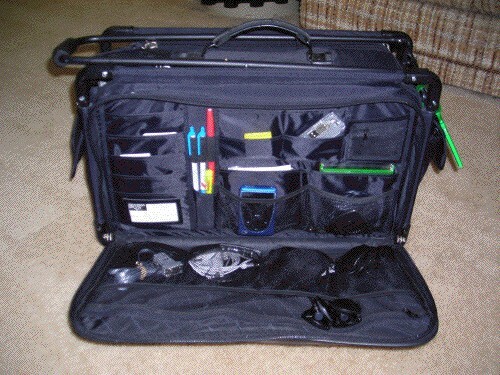 Although it stows easily by folding back across the top of the case, it doesn't lock in place when stowed. So, when you put it in an overhead with the wheels in first, the handle has a tendency to "float" back out into the cabin before they close the overheads, and if people are still walking on the plane, you can "bean" someone with it. 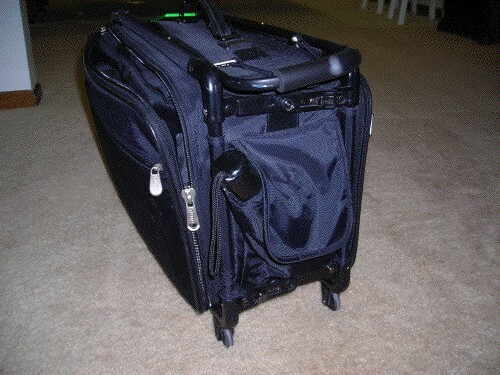 I also don't like the fact that the handle doesn't stay up when you are pulling the case. I really wish there were a way for it to stay in the natural position you use for pulling it. The way it is, when you approach an elevator or door, you have to rest the handle against your body or against the wall, use your hand to open the door/push the elevator button, and then grab it again. Alternatively, you can just let it clear back down in its resting position and then bend back down and grab it. 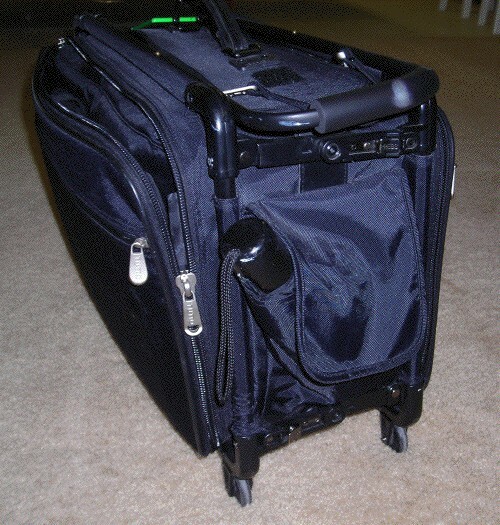 Small concern, but when you're traveling and have your arms full of stuff, it sure would be nice not to have to deal with a handle that won't stay in one position. Probably way too much information, but the bottom line is that after spending tons of money on all kinds of cases, the benefits outweigh the negative aspects for me on this one.